Odin 3GP DVD Ripper an innovative 3gp dvd rip Windows application that transcodes your favorite DVD movies to mobile phone directly. It not only rips and converts DVD to 3GP format supported by many cell phones like Nokia, Sony Ericsson, Motorola, BlackBerry and Samsung but also rips audio to into MP3, WMA, AAC or WAV formats. The new in upgrade 5.3.2 version : load dvd title more correctly and rip dvd title more stably. Odin 3GP DVD Ripper - It is a esay to use DVD to 3GP converison software. ...... output video without any audio video out of sync problems. 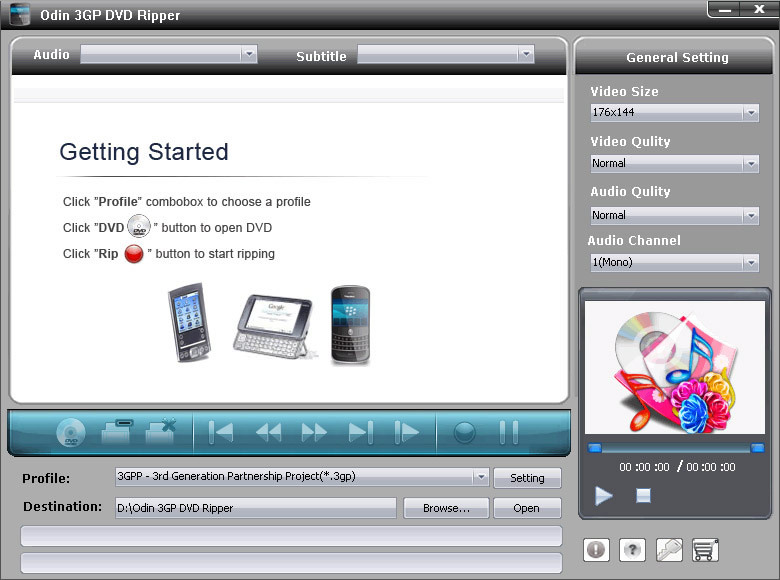 Features about Odin 3GP DVD Ripper version 5.3.21. 1. Rips DVD to Mobile 3GP file formats. Qweas is providing links to Odin 3GP DVD Ripper 5.3.2 as a courtesy, and makes no representations regarding Odin 3GP DVD Ripper or any other applications or any information related thereto. Any questions, complaints or claims regarding this application Odin 3GP DVD Ripper 5.3.2 must be directed to the appropriate software vendor. You may click the publisher link of Odin 3GP DVD Ripper on the top of this page to get more details about the vendor.